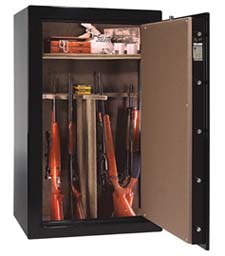 Remington Safes makes the Magnum 50 gun safe. Justin case you didn’t know it, this is a really big gun safe. We are not talking Fat Boy big, but this safe still holds 41 long guns, plus other storage. The Magnum 50 is the largest of the three models in the Magnum Series. Retail pricing for this safe is around $2,250. For all this storage, this is an excellent price. The gun safe also comes with a number of good security and fire protection features. However, there are a number of trouble spots you should be aware of before pulling the trigger, so to speak, and buying this safe. Locking Bolts: The locking bolts are long, 2.375 inches and fairly thick 1.25 inches. Longer and thicker in this context is generally good. UL Rating: This safe has a UL RSC rating. This means the UL safe experts have tried a frontal assault on the safe door for five minutes and the door held fast. Fire Rating: The fire rating is 60 minutes at 1,200° F. Please be aware that this is an in-house rating and has not been independently verified by a third party. You can read my thoughts on this issue, and many others at my Gun Safe Buying Guide. Weight: This safe weights anywhere from 1,035 to 1,105 pounds, depending on Remington Safes product literature. Either way, for a safe at this price, this is a good heavy safe. Height: The exterior height of the safe is 72.5 inches. This should be plenty tall for your collection. Price: I have already mentioned it, but $2,250 is a good price for a safe of this size. Steel: Steel thickness is 11 gauge. My preferred gauge is a minimum of 10 gauge, but this is fairly close. For those of you on a budget, this is one are you may want to think about compromising. Locking Bolt Sides: The Magnum 50 only has locking bolts on three sides. This is a tough one. Instead of giving my opinion on this, I will ask you the question. Do you fell okay about putting 40 of your guns in a gun safe with locking bolts on three sides? There are ten different interior and exterior color combinations you can choose from. The standard interior storage shelving can be configured 4 different ways depending upon your needs. You also get a door storage system for handguns and other items. I like the safe and for the money it offers you a lot of gun safe for the money. My biggest gripe is with the locking bolts. Having locking bolts on only three sides is a head scratcher. If you choose to go with safe, this is one of the key drawback areas you will need to reconcile with the excellent price.